Well now it feels like fall! We loved that week of heat, because the veggies loved it. It really gave them a good boost. And we’re grateful for the 80 degree forecast this week. It has been such a cool summer, often just barely warm enough to keep things growing, that it was nice to feel the heat and see things take off again. The rain has been good overall, though at this point we’re enjoying this dry weather. So many crops are mature and nearly ready to be picked — winter squash, sweet potatoes, and more — that more rain encourages rot and makes harvesting more difficult. (“Rot” is such a good generic term for the thousands of species and billions of individual organisms that eat things in slimy ways.) The few things that are still growing –kale, lettuce and spinach, a few carrots and beets, parsnips, strawberries and asparagus getting ready for next year — we can easily water in a dry fall. But we’ll dance to whatever beet we’re given. It’s actually been a little quieter here in the last few days. The high point of tomatoes and melons is past, and we haven’t started in on those bigger fall harvests yet. That will start this week, as we’ll cut the winter squash from the vines, and place it in rows with room to get a tractor in the field. Then we let them sit in the sun for a day or a week or two, and pick them into those fancy new bins before a chance of fr-st.
For now, we’re still under construction and squeezing it in a few hours at a time. The electricians have been in and out getting the bigger wires hooked up to run the cooling system for the root cellar. And to give us actual outlets in the barn for the lights, washing equipment, etc, so we won’t be running it all on one extension cord like we have been since we built the first barn! Soon the garage doors should go in. We do our first big harvest for the Minneapolis Public Schools this week, hopefully with the “new” (circa 1965) carrot harvester. Like you, those kids can plan on eating our carrots from now until spring comes back again. We’re glad to do it for all of you! Hope you enjoy the beauty of fall, in all parts of life! Winter Squash — We’ll start with spaghetti squash this week. It’s the only squash that’s really ready right now — the other 10 or so types we grow look good, but don’t taste good and need to ripen for 1-3 weeks still. As usual we will wash and give you the best-tasting squash as they ripen. Our goal is to give you squash so sweet there’s no need for syrup or sugar (although those are still yummy to add of course!) Next to ripen are usually acorn, carnival, and pie pumpkins, followed by delicata, buttercup, amberup and then butternut. We think most of the squash is both smaller and later due to the cool summer. But it looks good, and there should be plenty to stock your tables full of it. Spinach is enjoying this weather. There’s a teeny bit of fungal pathogen damaging a few leaves, which is one reason we want the rain to stop. We have tons planted and babied it with fertility, so if it stays healthy we’ll be picking until late in October. Kale — We switched to the younger fall planting and it was fun to see that many of you noticed — the leaves are much more tender to the touch. And it tastes better too, and will taste even better as the fall goes on. Tomatoes — We have a late planting coming in that should keep these in the share until fr-st, though the numbers will be lower. We think we’ll have at least 2-4 for the next couple weeks. Peppers are gorgeous!! We love the colors they add to fall. They’re as good for the eyes and heart as flowers are. If we’re lucky we get to keep picking them all October. Reds, greens, and a few oranges and yellows. Watermelons and cantaloupes— Had a pretty good season. The flavor was the most consistent we’ve ever seen. Rain and cool weather often degrade the flavor, and while a couple icky ones did slip through our fingers, for the most part it seems they were really tasty for the month we had them. The wild thing now is that one variety –which looked dead as a doornail — has sprouted new growth and is now flowering again. Who knows, if it’s a really warm fall, maybe we’ll have watermelon again in November. We’ve seen them try and not make it happen before, but it sure would be fun to see. The cucumbers and summer squash have had a better start to September than we’ve ever seen. Now that it’s been chilly though, any day now we expect to go out and find next to nothing that’s edible. Garlic will be a part of the share for 1 more week, for 6 total. After that it will be for sale for $1/head. You can buy more now at that price if you like, and we don’t need advance notice for garlic, unless you’re stocking up for winter. Which you can do, but let us store it for you until September or October. Broccoli harvest may continue to go up and down, the rain has been causing a fungus called “brown bead” to wreck many heads before they even mature. Go sun! Eggplant is doing well so far in the coolness too. Like the melons, the Asian eggplants are having a resurgence of flowers, “thinking” they might get to produce another good generation of fruit. For now, it’s mostly the globe ones, big and beautiful. And all else looks good — carrots, beets, eggplant, onions,cabbage, swiss chard, and lettuce and greens. We need U-Pick containers. Please bring only clean ones. Thank you! Raspberry bugs reproduced quickly in the heat, but should taper down now that it’s cooler. We expect to harvest, with yields and picking limits going up and down, for 2-4 more weeks. Cherry tomatoes, tomatillos and ground cherries — The cherries are down to final gleaning, since the plants didn’t make the later, upper rounds of flowers. The tomatillos and ground cherries have slowed way down in ripening. We’ll give them all a more fertile home next year. Basil — There is still downy mildew on the plants, it might have to be eaten even quicker than usual after harvesting. Beans, Flowers and the other Herbs are all looking good. Beans and flowers should go until fr-st. The last planting of beans (the eastern two rows) is loaded with nice fruits. Please always check the U-pick board when you’re here to confirm what’s available and picking amounts. Please bring your own scissors for U-pick. If you don’t have them with you, ask Erin or Ben as we have a few pairs we can loan out. And bring pruning shears for those giant sunflowers! With the petals gone by and the seeds formed, they can be hung as a bird feeder. 1) We are doing the November Storage Share as usual. 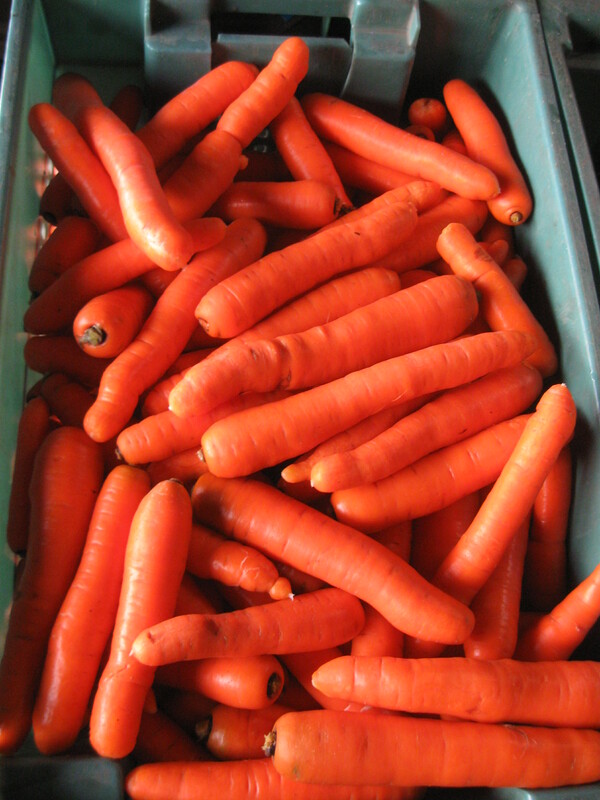 We can store some carrots and maybe other root crops for you, in the new root building. 2) If you are able this year, full payment in September will help us with construction overruns and related expenses. If that doesn’t work for you, no worries, we of course understand. 3) In addition to the November Storage Share, we are currently planning on being “open” for purchase of root crops once a month through the winter, starting in December. This is for folks who want more roots through the winter, and/or don’t want the variety in the storage share, and/or for whom storing the crops isn’t feasible. However, we will almost definitely not have winter squash, potatoes, garlic, onions or other crops available at the “winter store.” The new root storage is for just a few root crops — it’s too cold and humid for everything else. If you want the other crops — and we think you should, they’re all so good! — please buy a storage share. Also, if it works for you, the storage share is definitely the best deal for you. It’s an efficient, one day extravaganza for us, given the amount and variety of food it adds up to. You can buy by the pound to suit your needs at the “winter roots store,” but prices will be higher. It won’t be fancy or big — we’ll be filling the barn with equipment and noise while washing roots in there for wholesale accounts — but there is a little extra expense in it for us. We asked in last year’s survey about doing a winter CSA, with monthly pickups through February or March, but based on your responses we decided to stick with this Storage Share. Mostly, there wasn’t enough enthusiastic interest for us to justify the work involved in storing all these crops as long as possible and in doing monthly pickups. So as a service with the new building, we can store part of your storage share here until later in the winter — but just the carrots, beets, parsnips, radishes and turnips. Note this doesn’t include winter squash, onions, potatoes, etc — the conditions required for carrot storage are much too cold and humid for those crops. In general, this year’s storage share will be similar to the last six years’, varying according to this year’s yields. It is separate from the regular season share, a one-time pickup in November before Thanksgiving, and we hope it looks something like this: two bags of super sweet fall carrots (20 lbs total), a smaller bag of mixed fall roots, 3-5 squash, +/- 10 lb potatoes, +/- 5 lb sweet potatoes, Brussels sprouts, garlic, onions and leeks, kale and maybe cabbage. For dried herbs, a selection of thyme, sage, oregano and rosemary. It’s early to predict yields and September will tell us more, but yields for all these crops are looking average or above. Of course nothing is certain to be in the share, and sharing the losses and bounties are part of the CSA relationship — but right now we don’t see any big changes to that veggie lineup. In a large saucepan, place diced tomatoes, roasted red peppers, onion, red wine, brown sugar, hot chile peppers, tomato paste, distilled white vinegar, garlic, oregano and cumin seeds. Bring to a boil, then reduce heat and allow mixture to simmer approximately 30 minutes. Place mixture in a blender, and blend to desired consistency. Chill in the refrigerator 4 hours, or until cold, before serving. 1. Preheat oven to 400 degrees F. Brush cut sides of squash with oil, and sprinkle with salt and pepper to taste. Place squash, cut sides down, on a rimmed baking sheet. Bake until tender, about 45 minutes. 2. While the squash is baking, make the creamy roasted red pepper sauce. Roast red peppers over gas flame, under the broiler, or on the grill. Roast for about 10 minutes, or until peppers are completely black. Place peppers in a paper bag to allow to sweat. Peel the charred skins from the peppers and remove the seeds. Chop the peppers and set aside. 3. In a large saucepan, heat the olive oil over medium heat. Add onion and sauté until softened, about 3 minutes. Stir in garlic and cook for 2 minutes. Add the red peppers and diced tomatoes. Add oregano, red pepper flakes, fresh basil, and season with salt and pepper. Simmer on stove for 10 minutes. Stir in the Greek yogurt. Purée the sauce in the pan, using an immersion blender. You can also transfer the sauce to a blender or food processor, but be careful. Make sure the sauce is not super hot so you don’t get burnt. Puree until smooth, with some texture remaining. 4. When the squash is done baking, let it cool for a few minutes-until you can touch it. Scrape the squash with a fork to remove flesh in long strands. Place in a large bowl or on individual plates. Top spaghetti squash with the creamy roasted red pepper sauce and serve warm.